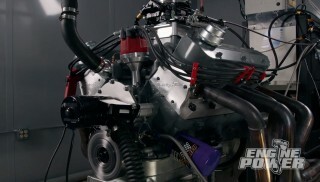 A "takeout" LQ4 powerplant becomes the test bed for a series of affordable engine upgrades. Serious automotive firepower starts with a spark. E3 Spark Plugs can help you create a fire-breathing street or strip beast with its line of spark plugs featuring E3’s advanced DiamondFire electrode design. Evans Waterless Coolant High Performance Coolant is a proprietary fluid with a specially-formulated inhibitor package designed for all gasoline, light-duty diesel, LP, and CNG engines. Clippster headers from Patriot feature longer primaries that exit toward the rear of the engine compartment to clear steering and suspension components. 5w-20 - Royal Purple focuses exclusively on developing state-of-the-art lubricants. (NARRATOR)>> WHETHER IT'S FOR THE STREET OR FOR THE STRIP WE'VE GOT YOU COVERED. 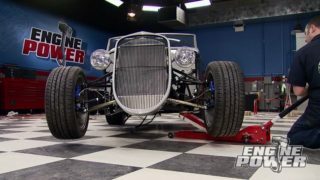 TODAY ON ENGINE POWER WE PREP OUR TRIPLE THREAT POWER PLANT FOR PLENTY OF POWER. PLUS A TAKEOUT LQFOUR BECOMES THE TEST BED FOR SOME POWER ADDERS DESIGNED TO MAKE YOUR DAILY DRIVER A LOT MORE FUN. (PAT)>> WELCOME TO ENGINE POWER. TODAY WE'RE GETTING BACK ON OUR TRIPLE THREAT PROJECT, WHICH IS THIS 1973 SPLIT BUMPER CAMARO THAT WE WILL BE TAKING TO OUR ANNUAL BARBECUE AND BURNOUTS COMPETITION LATER THIS YEAR. OUR VERSION OF A TRIPLE THREAT CAR IS PRETTY STRAIGHT FORWARD. IT HAS TO BE A STREET CAR THAT LAYS DOWN BIG NUMBERS ON THE DYNO, TURN IN RESPECTABLE LAP TIMES ON A ROAD COURSE, AND RUN THE QUARTER MILE IN STELLAR FASHION. (MIKE)>> THAT CAR IS WHAT I CALL A SURVIVOR. IT'S UNMODIFIED AND WAS OWNED BY ONE WOMAN PRETTY MUCH ITS ENTIRE LIFE. NOW SHE WORKED FOR TIFFANY AND COMPANY IN NEW YORK CITY, AND BOUGHT THE CAR BRAND NEW. THAT EXPLAINS THE FACTORY UNDERCOATING. WITHIN ONE MONTH SHE WAS TRANSFERRED TO THE SOUTHERN CALIFORNIA TIFFANY LOCATION, AND SHE SHOWED UP WITH HER OLD CAMARO IN TOW. NOW IN THE MID 1990'S THE CAR WAS ALMOST DESTROYED BY WILDFIRES. NOW IT DID HAVE SOME PAINT WORK DONE BECAUSE IT WAS DAMAGED, BUT THERE WAS NO BODY WORK DONE. NOW THE CAR THEN WAS SOLD IN 2015 TO A GENTLEMAN IN KENTUCKY. LAST YEAR IT CAME UP FOR SALE AGAIN AND HEY, WE COULDN'T PASS IT UP. THAT'S WHY IT'S IN OUR SHOP. 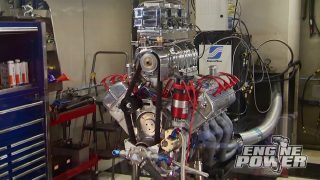 (PAT)>> THE POWER PLANT FOR A TRIPLE THREAT CAR HAS TO BE STOUT, AND WITH THAT IN MIND WE WANTED TO DO SOMETHING A LITTLE BIT DIFFERENT THAN A CONVENTIONAL SMALL BLOCK CHEVY OR LS SETUP. SO WHY NOT COMBINE THE TWO FOR A SUPER SOLID FOUNDATION. WE'LL BE USING A WORLD PRODUCTS MOTOWN LS BLOCK FOR THAT, AND HERE'S A QUICK LOOK AT WHAT WE HAD DONE TO IT. AFTER ARRIVING FROM SUMMIT RACING WE HAULED IT TO SHACKLETT AUTOMOTIVE MACHINE IN NASHVILLE, TENNESSEE. THERE IT RECEIVED SEVERAL MACHINING OPERATIONS. THE CYLINDER BORES WERE BORED AND TORQUE PLATE HONED TO FOUR-185. THE DECKS WERE ALSO EQUALIZED TO NINE-240. 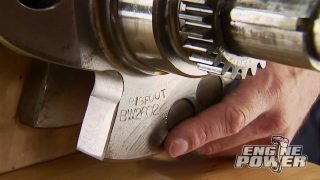 THE ALIGN BORE WAS CHECKED AND FOUND TO BE RIGHT ON THE MONEY FROM WORLD PRODUCTS. HERE'S A LOOK AT WHAT THIS BLOCK IS ALL ABOUT. 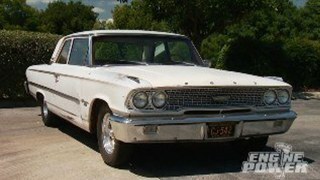 (MIKE)>> NOW THIS BLOCK ACCEPTS SMALL BLOCK CHEVY PARTS FROM THE DECK DOWN. FROM THE DECK UP IT'S ALL LS INDUCTION. NOW WE ORDERED THIS WITH ALL THE ITEMS NEEDED TO FINISH IT OFF, PLUS A BUNCH OF OTHER PARTS. (PAT)>> EVEN THOUGH IT'S BACK FROM THE MACHINE SHOP, THERE'S STILL SOME WORK TO BE DONE. A BRAND NEW BLOCK STILL HAS A LOT OF SHARP EDGES FROM BEING MACHINED. SO WE'RE GONNA SPEND A FEW MOMENTS DEBURRING THEM. ALSO WE WANT TO IMPROVE SOME OIL FLOW. SO A COUPLE OF DIFFERENT AREAS WILL GET SOME ATTENTION TO HELP THAT PROCESS. HERE'S A LOOK AT THE ITEMS WE'LL BE USING, AND THE MOST IMPORTANT ONE HERE IS SAFETY GLASSES. TO GET THE JOB DONE, GRINDERS, A VARIETY OF CARBIDE BURRS, AND CARTRIDGE ROLLS WILL BE NECESSARY. I'LL START BY DEBURRING ALL THE SHARP EDGES USING THE DYE GRINDER AND A CARBIDE BURR. THE OBJECT IS TO REMOVE ONLY ENOUGH MATERIAL TO GET RID OF THE SHARP EDGE. USING VERY LIGHT PRESSURE AND KEEPING THE BURR MOVING IS KEY. HERE'S A BEFORE AND AFTER LOOK AT WHAT IT DOES. FOR OIL PASSAGES A SANDING ROLL IS USED BECAUSE IT'S LESS AGGRESSIVE AND CREATES A SMOOTHER SURFACE FINISH. TO PROMOTE A GOOD SEAL A DISC SANDER WITH A SCOTCH BRITE PAD IS RUN OVER THE OIL PAN RAIL AND OTHER GASKET SURFACES. THE NEXT STEP INVOLVES A THREAD CHASING KIT FROM MATCO. EVEN THOUGH THIS IS A BRAND NEW BLOCK, I'LL STILL CHASE EVERY THREADED HOLE. CHASERS DIFFER FROM TABS IN THAT THEY ONLY REMOVE DIRT OR MACHINING DEBRIS FROM THE THREADS INSTEAD OF CUTTING NEW ONES. BE SURE TO DO THIS BY HAND BECAUSE IT IS TEMPTING TO USE AN IMPACT DRIVER OR A DRILL TO SPEED UP THE PROCESS. GETTING TOO CRAZY WITH IT CAN ACCIDENTALLY DAMAGE THE THREADS OR WORSE, BREAK OFF A CHASER IN THE HOLE, AND THEN YOU HAVE A REAL PROBLEM ON YOUR HANDS. NEXT ON THE TO DO LIST IS GAPPING THE PISTON RINGS. OUR GOODSON RING FILER MAKES THIS JOB GOES QUICK AND ACCURATE. WE FIT THE RING SETS TO EACH INDIVIDUAL CYLINDER. ACCORDING TO MAHLE'S CHART, INCLUDED WITH THE RINGS, NATURALLY ASPIRATE CIRCLE TRACK AND DRAG RACE ENGINES REQUIRE A MINIMUM END GAP OF FIVE THOUSANDTHS PER INCH OF CYLINDER BORE ON THE TOP COMPRESSION RING. OUR GAP IS SLIGHTLY LARGER DUE TO THE FACT THAT WE MAY OR MAY NOT RUN A SMALL SHOT OF NITROUS. SO 22 THOUSANDTHS IS OUR TARGET. HERE'S A TIP. WHEN FILING RINGS, ALWAYS FILE THE SECOND COMPRESSION RING FIRST. THIS WILL GIVE YOU A CHANCE TO VERIFY THE ACCURACY OF YOUR GRINDS SINCE THE TOP RING GAP IS MORE CRITICAL. WHEN CHECKING THE GAP IN THE BORE MAKE SURE TO USE A RING SQUARING TOOL TO GET ACCURATE AND REPEATABLE READINGS. THE OIL SUPPORT RAILS NEED A MINIMUM GAP OF 15 THOUSANDTHS. SO BE SURE TO CHECK THEM AS WELL. (NARRATOR)>> COMING UP, WE TAKE OUR TAKEOUT INTO THE INTERROGATION ROOM TO SEE WHAT IT CAN TELL US. PLUS THE PERFECT COOLANT TO KEEP IT COOL WHEN THE HEAT IS ON! 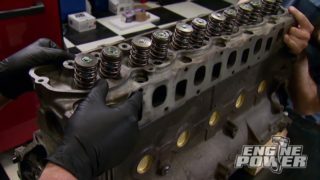 (PAT)>> WE'RE GONNA TAKE A LITTLE BREAK FROM THE ACTION ON OUR 440 CAMARO ENGINE BUILD TO DO SOMETHING DIFFERENT, AND I'M GONNA CALL IT TAKEOUT TECH, AND WHAT THAT REFERS TO IS GOING TO A SALVAGE YARD OR A DONOR VEHICLE AND GETTING A RUNNING ENGINE FOR YOUR VEHICLE. NOW THAT CAN BE ANYTHING FROM A DAILY DRIVER TO A HOT ROD, OR EVEN SOMETHING THAT YOU'LL TAKE OFF ROAD, AND A VERY POPULAR ENGINE FOR THAT IS THIS, AN LQFOUR TRUCK ENGINE. NOW THERE'S A LOT OF PARTS THAT ARE AVAILABLE FOR IT AND IT'S EASY TO GET RUNNING OUT OF THE BOX. ONE QUESTION WE ALWAYS GET ASKED IS WHY DON'T YOU DYNO THE ENGINE WITH SOME OF THE STOCK PARTS ON IT? WELL THAT'S A GOOD POINT. SO TODAY WE'RE GONNA TAKE AND GET THIS ENGINE RUNNING WITH THE MINIMAL AMOUNT OF PARTS WE HAVE TO TO GET IT ON THE DYNO. THE EASIEST AND CHEAPEST WAY TO GET THIS BULLET MAKING STEAM IS TO CARBURET IT. SO WE'LL START THERE. A HOLLEY MID RISE DUAL PLANE INTAKE WILL BOLT RIGHT UP TO THE STOCK HEADS. CONTROLLING THE SPARK IS THIS MSD LS SERIES IGNITION BOX, WHICH TIES INTO THE STOCK CRANK AND CAM SENSORS TO MAKE THIS A STAND ALONE READY TO RUN SYSTEM. SINCE WE'RE GONNA START DYNOING WITH STOCK COMPONENTS I'VE SET UP A TEST ON OUR SUPER FLOW SF-750 FLOW BENCH TO SHOW YOU WHAT A 317 CASTING, WHICH IS THE SAME AS OUR DONOR ENGINE, WILL DO FOR FLOW. NOW THESE HAVE SOME PRETTY RACY SPECS RIGHT FROM THE FACTORY. THE INTAKE PORT COMES IN AT 210cc, AND THE EXHAUST IS 75cc. THEY HAVE A 71cc COMBUSTION CHAMBER, AND THE VALVES ARE TWO INCH ON THE INTAKE, ONE-550 ON THE EXHAUST. SO LET'S FIRE UP THE BENCH AND SEE WHAT THESE THINGS FLOW. 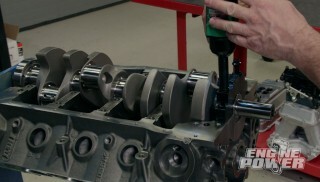 A FLOW BENCH IS A GREAT TOOL FOR EVALUATING THE POTENTIAL POWER OF YOUR CYLINDER HEADS. WE'LL CHECK THE AMOUNT OF FLOW IN 100 THOUSANDTHS INCREMENTS ALL THE WAY UP TO 600 THOUSANDTHS LIFT. I'M MAKING SURE TO LET THE READING STABILIZE BEFORE WRITING IT DOWN. YOU'VE OBVIOUSLY NOTICED THE CLAY AROUND THE PORT. THIS IS IN PLACE TO ELIMINATE THE SHARP EDGE ON THE ENTRY OF THE PORT, WHICH WOULD CAUSE INACCURATE READINGS DUE TO TURBULENCE. 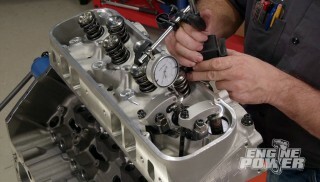 ONCE ALL THE RESULTS ARE MEASURED WE HAVE A GOOD SNAPSHOT OF THE CYLINDER HEAD'S CAPABILITY TO PRODUCE HORSEPOWER. EVEN THOUGH IT'S A STOCK HEAD, THE 317'S MODERN PORT DESIGN FLOWS AS WELL OR BETTER THAN MANY OLD SCHOOL PORTED SMALL BLOCK CHEVY HEADS FROM BACK IN THE DAY. 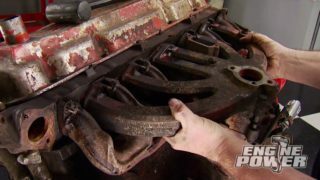 LIKE MANY SALVAGE YARD ENGINES, THE PORTS HAVE A LOT OF GUNK IN THEM. IT'S INTERESTING THAT ALL OF THAT CRUD DID NOT EFFECT THE FLOW NUMBERS MUCH AT ALL. (MIKE)>> OVER AT THE ENGINE I'M INSTALLING A POWER BOND REPLACEMENT BALANCER. NEVER USE THE BALANCER BOLT TO DRAW THE BALANCER ON. YOU CAN DESTROY THE THREADS IN THE CRANK SNOUT. AN INSTALL TOOL WILL AVOID THAT AND ALLOW THE BALANCER TO SEAT PROPERLY. AN ARP BALANCER BOLT IS GOING IN TO HOLD IT IN PLACE. IT'S ALSO REUSABLE UNLIKE THE FACTORY TORQUE TO YIELD ONE. 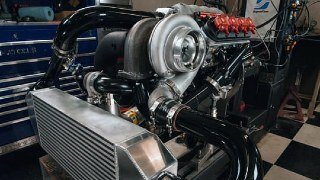 AS USUAL A MAZIERE ELECTRIC WATER PUMP WILL KEEP THIS ENGINE COOL ON THE DYNO. WD 40 IS USED AROUND THE INTAKE PORTS SO THE ORINGS IN THE MANIFOLD SEAL PROPERLY. DOING THIS DRY CAN DAMAGE THE SEALS. THIS IS HOLLEY'S DUAL PLANE MANIFOLD FOR LSONE, TWO, AND SIX ENGINES, WHICH HAVE A CATHEDRAL STYLE PORT. 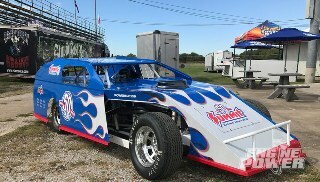 IT ACCEPTS A 41-50 SQUARE FLANGE CARB OR THROTTLE BODY, AND HAS AN OPERATING RANGE FROM 1,500 TO 6,500 RPM. WE'LL TORQUE IT TO 100 INCH POUNDS. THE STOCK CAM SENSOR IS INSTALLED, FOLLOWED BY THE CRANK SHAFT SENSOR. NEXT THE OEM COIL PACK SETUPS GO ON. THIS IS TYPICALLY WHAT YOU WOULD GET WITH A DONOR ENGINE. FINALLY WE'LL SCREW IN A SET OF ETHREE DIAMOND FIRE SPARK PLUGS. ONE OF THE COOL THINGS ABOUT THESE PLUGS IS THERE'S NO GAPPING NEEDED. THEY ARE PRECISELY ENGINEERED FOR OPTIMUM SPARK EFFICIENCY FROM THE FACTORY. WITH THE ENGINE ON THE DYNO STAND, AND THE FLYWHEEL INSTALLED, IT'S ROLLING INTO THE CHAMBER. WE'LL RUN IT WITH A ONE INCH CARB SPACER AND A TRUSTY LITTLE 650 CFM CLASSIC HP FROM HOLLEY. TRICK FLOW STEAM VENT LINES ARE RAN AT THE FRONT, AND INCH AND FIVEEIGHTHS PATRIOT SHORT HEADERS FOR AN LS SWAP INTO A '70 THROUGH '81 CAMARO WILL LET THIS STOCK HEADED SIXO BREATHE. ROYAL PURPLE FIVEW-20 HIGH PERFORMANCE STREET OIL IS GOING IN OUR GOODSON PRIMING TANK. THE TANK WILL BE PRESSURIZED SO IT CAN FORCE OIL INTO THE ENGINE AND PREPRIME IT. (NARRATOR)>> UP NEXT, A BASELINE DYNO RUN FOR THE LQFOUR. 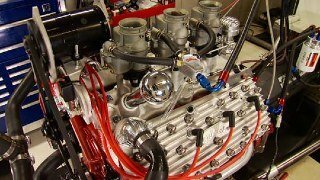 (MIKE)>> WHEN RUNNING A CARBURETOR ON AN LS ENGINE WE HAVE TO HAVE A WAY TO CONTROL THE IGNITION SIDE. SO WE'RE USING AN MSD IGNITION CONTROLLER FOR THAT. NOW WHAT I'M GONNA DO IS SET IT UP SO IT HAS 18 DEGREES OF TIMING AT START UP, AND THEN IT'LL BE LIKE A LOCKED OUT DISTRIBUTOR FROM THERE ON WITH 24 DEGREES TOTAL ALL THE WAY THROUGH THE RPM RANGE. (PAT)>> ALL RIGHT, WE'RE STARTING THIS UP. WE'RE GONNA BE RUNNING IT ON 93 OCTANE PUMP GAS, AND THE TIMING IS GONNA BE CONSERVATIVE, 24 DEGREES TOTAL BECAUSE WE DON'T KNOW REALLY WHAT'S GOING TO HAPPEN. SO IT'S GONNA BE RUN FROM 3,000 TO 6,000 RPM ON THE PULLS. (PAT)>> THAT WAS VERY SMOOTH, VERY CLEAN. WHAT DO THESE THINGS MAKE STOCK? (MIKE)>> THEY'RE IN THE 320 RANGE, FACTORY. THAT TORQUE NUMBER'S REALLY NICE. LOOK AT THE OIL PRESSURE. (PAT)>> IT HAS ALL KINDS OF OIL PRESSURE. WITH FIVE-20 OIL AT THE TOP OF THE PULL HAS 87 POUNDS OF PRESSURE. THROW SOME SORT OF TIMING IN IT. I DON'T SEE ANY SORT OF REASON WHY YOU WOULDN'T. (PAT)>> THAT SPICED HER UP A LITTLE RIGHT THERE. 354 HORSE, 408 POUND FEET OF TORQUE. THAT'S A TIDY LITTLE GAIN, AND YOU DIDN'T HAVE TO TWIST THE DISTRIBUTOR. YOU JUST GO PUNCH A COUPLE OF NUMBERS. (MIKE)>> PUNCH A COUPLE NUMBERS IN, HIT ENTER, AND CLOSE IT OUT. (MIKE)>> GET RID OF SOME OF THAT, MANIFOLD VACUUM. (PAT)>> HOW DO YOU LIKE THAT? THERE'S A LITTLE BOOST IN POWER. 414 POUND FEET OF TORQUE, 364 HORSE, THAT'S JUST AIR RIGHT THERE. YOU'RE TAKING THE RESTRICTION OUT OF THE TOP CAUSE LOOK WHAT THE MANIFOLD VACUUM DID. THERE'S NO PLACE THAT IT'S OVER ONE INCH OF VACUUM IN THE MANIFOLD. IT IS A BIT RICH UP TOP. YOU'RE GETTING BRAKE SPECIFIC IN THE 55, 56 RANGE. YOU COULD PULL SOME JET OUT OF THAT AND MAYBE SNEAK AN AIR BLEED IN IT AND IT WOULD PICK UP A LITTLE POWER. THIS IS LITERALLY A DONOR BONE STOCK LQFOUR TAKEOUT THAT WE DID THE ABSOLUTE MINIMUM IF YOU WERE GONNA PUT IT IN A HOT ROD OR SOMETHING. WE STUFFED A CARBURETOR ON IT, A STAND ALONE IGNITION SYSTEM. 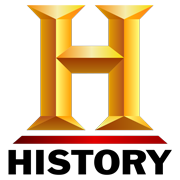 (MIKE)>> AND IT MAKES RESPECTABLE NUMBERS. (PAT)>> AND IT MAKES EXTREMELY GOOD NUMBERS. 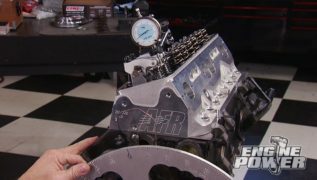 (MIKE)>> AND IT SHOWS THAT THAT CARBURETOR'S NOT TOO BIG. (PAT)>> THE CARBURETOR IS NOT TOO BIG. THE MISCONCEPTION IS A BIGGER CARBURETOR WILL FLOOD AN ENGINE. THAT'S NOT HOW A CARBURETOR WORKS. ACTUALLY THAT CARBURETOR, IT WOULD HAVE FINE STREET MANORS. IT'S VERY RESPONSIVE. IT COULD BE ON A STOCK 364 INCH ENGINE OR A 500 PLUS INCH BIG BLOCK AND HAVE A FUEL CURVE THAT LOOKS BEAUTIFUL. ALL RIGHT, NICELY DONE! (NARRATOR)>> UP NEXT, FOR MAXIMUM PERFORMANCE KEEPING YOUR COOL IS CRUCIAL. (PAT)>> ALL ACROSS THE POWERNATION WE ARE BIG FANS OF EVANS WATERLESS COOLANT. IT HAS A BOILING POINT OF 375 DEGREES FAHRENHEIT. OVER 100 DEGREES HIGHER THAN TRADITIONAL ANTIFREEZE. IT PREVENTS CORROSION CAUSED BY WATER, AND IT'S DESIGNED TO LAST THE LIFE OF THE ENGINE. IT OPERATES UNDER LOW PRESSURE, REDUCING STRESS ON COOLANT HOSES, GASKETS, AND OTHER COMPONENTS OF THE COOLING SYSTEM. TO FIND OUT MORE ABOUT EVANS COOLANT WE WENT STRAIGHT TO THE SOURCE. (MIKE)>> HEY EVERYBODY, WE'RE HERE WITH MIKE TOURVILLE FROM EVANS WATERLESS COOLANT. NOW THIS IS A HIGH PERFORMANCE WATERLESS ENGINE COOLANT THAT WE'VE USED IN THE PAST WITH EXCELLENT RESULTS. NOW YOU MAY BE WONDERING, WATERLESS, HOW DOES THAT ALL WORK? MIKE, FILL US IN. (MIKE T.)>> YOU'RE RIGHT MIKE, WATERLESS DOESN'T MEAN LIQUIDLESS, WHICH A LOT OF PEOPLE THINK SO, BUT EVANS IS A WATERLESS COOLANT, AND IT'S MOST IMPORTANT FEATURE IS ITS HIGH BOILING POINT OF 375 DEGREES. NOW THAT MEANS EVANS WON'T FORM VAPOR, IT WON'T BUILD PRESSURE, BUT MOST IMPORTANTLY IT WON'T BOIL OUT OF YOUR SYSTEM. IN ADDITION, I THINK IT'S CORROSION PROTECTION AND THE FACT THAT IT DOESN'T SUPPORT ELECTROLYSIS IS REALLY IMPORTANT. (PAT)>> NOW YOU'VE GOT SOME NEWS ABOUT SOME OTHER THINGS THAT YOU'RE DOING AS FAR AS POWER SPORTS AND SOME MUSEUM STUFF. TELL ME ABOUT IT. (MIKE T.)>> YEAH THERE'S A LOT OF INCREASED USE IN POWER SPORTS. A LOT OF MOTOR CROSS RACERS, DIRT BIKE RIDERS, ATV'S, UTV'S. THEY DRIVE IN THE MUD. THEY GET THE MUD CAKED ON THE RADIATOR. THEY HAVE A TENDENCY TO OVERHEAT. EVANS WILL PREVENT THAT FROM HAPPENING, AND YES, A LOT OF CAR COLLECTORS AND MUSEUMS ARE BEGINNING TO USE EVANS BECAUSE OF PRESERVATION REASONS. IT STOPS ELECTROLYSIS, STOPS CORROSION, AND YOU DON'T HAVE TO CHANGE THE COOLANT OUT FREQUENTLY. IN FACT THE AMERICAN MUSCLE CAR MUSEUM IN FLORIDA HAS BEGUN USING EVANS AND CONVERTING ALL THEIR CARS FOR PERMANENT PROTECTION. (PAT)>> NOW WHAT I'M EXCITED ABOUT IS YOU'VE GOT SOME GREAT NEWS WITH NHRA. (MIKE T.)>> OH YEAH, WE ARE NOW NHRA ACCEPTED. IT CAN BE USED ON THE TRACK. 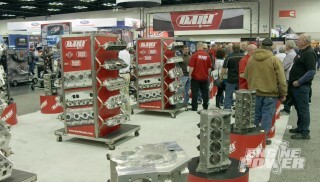 WE'RE A CONTINGENCY SPONSOR FOR THE NHRA AS OF LAST YEAR. (PAT)>> THAT'S A BIG DEAL BECAUSE BEFORE YOU COULD ONLY USE WATER, AND BECAUSE OF THE WAY EVANS WORKS IT'S MORE ADVANTAGEOUS TO USE IT INSTEAD OF WATER. (MIKE T.)>> YEAH, AND I THINK THE BIGGEST ADVANTAGE IS IT'S LOW PRESSURE. 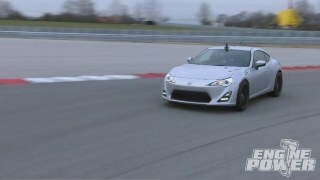 THE FACT THAT IT'S UNLIKELY TO GET ON THE TRACK, AND IT'S A MUCH SAFER, LOWER PRESSURE. IT GIVES THESE RACERS A HUGE ADVANTAGEOUS TO USE EVANS, AGAIN, BECAUSE OF THE BOILING POINT AND THE LOW PRESSURE. (MIKE)>> MIKE, WHEN SOMEBODY WANTS TO CONVERT TO EVANS FROM SAY COOLANT OR WATER IN A RACING ATMOSPHERE, WHAT IS THE NORMAL PROCESS? (MIKE T.)>> WELL YOU WANT TO MAKE SURE YOU DO A VERY THOROUGH JOB OF GETTING THE OLD COOLANT OR WATER OUT OF THE SYSTEM. THAT MEANS DRAINING IT. THEN USING AIR, USUALLY HIGH VOLUME AIR, TO FORCE WHAT'S IN THE BLOCK AND RADIATOR OUT OF THE SYSTEM. ONCE THAT'S OUT WE RECOMMEND YOU USE PREP FLUID. (PAT)>> NOW ON A BRAND NEW FILL YOU DON'T HAVE TO USE THE PREP FLUID AT ALL? (MIKE T.)>> CORRECT, IF IT'S A DRY ENGINE JUST USE THE HIGH PERFORMANCE COOLANT. YOU DON'T NEED THE PREP FLUID. (PAT)>> THANKS FOR COMING IN. WE'RE VERY EXCITED, AND WE'LL BE USING IT IN THE FUTURE. WE APPRECIATE EVERYTHING YOU GUYS DO. (MIKE T.)>> ANYTIME! 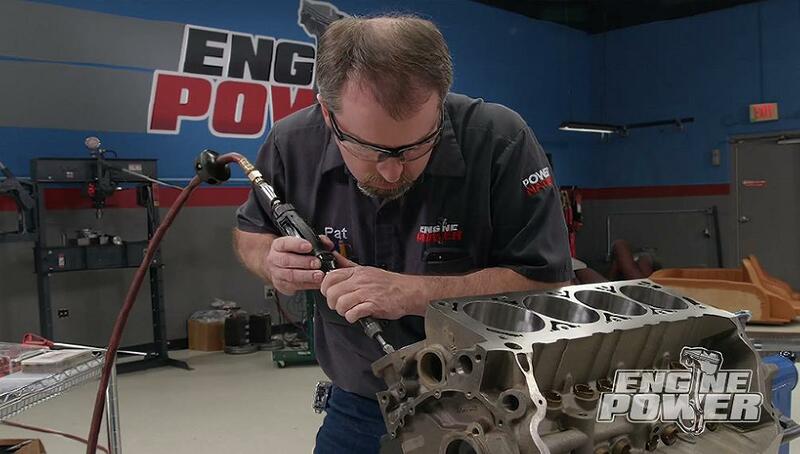 (PAT)>> FOR MORE INFORMATION ON EVANS WATERLESS COOLANT, OR ANYTHING YOU'VE SEEN ON THE SHOW TODAY, GO TO POWERNATION TV DOT COM. (MIKE)>> FOR TODAY'S POWERNATION EXTRA WE'RE GOING TO DISCUSS THERMOSTATS. WHEN IS ONE NEEDED, WHEN IS ONE NOT, AND WHAT ARE THE BENEFITS OF A RESTRICTOR FOR RACING APPLICATIONS? FIRST THINGS FIRST, WHAT IS THE THERMOSTAT'S JOB? WELL IT'S PRETTY SIMPLE. WHEN THE ENGINE IS COLD IT'S DESIGNED TO BLOCK THE FLOW OF COOLANT FROM THE ENGINE TO THE RADIATOR UNTIL THE COOLANT IS UP TO THE THERMOSTAT'S TEMPERATURE RATING. AT THAT POINT THE THERMOSTAT SLOWLY STARTS TO OPEN, ALLOWING HOT COOLANT TO ENTER THE RADIATOR TO COOL OFF. MOST ENGINE WEAR OCCURS WHEN THE ENGINE IS COLD. SO A THERMOSTAT AIDS IN GETTING THE ENGINE TEMPERATURE UP FASTER TO PREVENT COLD WEAR. NOW KEEP IN MIND, CHANGING A THERMOSTAT OUT TO A COOLER RATING IS NOT GOING TO MAKE YOUR ENGINE RUN COOLER. WHAT'S GONNA HAPPEN IS THE THERMOSTAT IS GONNA BE OPEN ALL THE TIME AT TEMPERATURE ALLOWING A STEADY RISE IN TEMPERATURE UNTIL THE ENGINE EVENTUALLY OVERHEATS. THE ONLY WAY TO FIX THAT IS A BETTER RADIATOR AND OTHER COOLING SYSTEM COMPONENTS. (PAT)>> NOW WE'VE SET UP A LITTLE DEMONSTRATION TO SHOW YOU EXACTLY HOW YOUR THERMOSTAT WORKS IN YOUR VEHICLE, AND THAT INCLUDES A PROPANE POWERED CAMPING STOVE, A POT FULL OF WATER, A GAUGE TO MEASURE THE TEMPERATURE, AND 160 DEGREE THERMOSTAT. WE'LL START BY LIGHTING THE BURNER. THEN PUTTING ON THE POT, AND THEN DROPPING IN THE THERMOSTAT. THIS IS REPRESENTING A WARM UP FROM A COLD START. WITH THE THERMOSTAT CLOSED, IT'S ALLOWING THE COOLANT AND THE ENGINE TO HEAT UP, NOT THE COOLANT IN THE RADIATOR. ONCE THE WATER HITS THE THERMOSTAT'S TEMP RATING IT WILL SLOWLY OPEN, WHICH WILL LET COOLANT ENTER THE RADIATOR. AFTER THE ENGINE IS SHUT OFF AND THE COOLANT LOSES HEAT, THE THERMOSTAT SLOWLY RETURNS TO ITS CLOSED POSITION. THE 187 DEGREE THERMOSTAT DOES THE EXACT SAME THING, JUST AT A HIGHER TEMPERATURE. 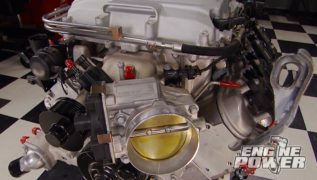 (MIKE)>> WHEN PAT AND I HOOK ENGINES UP ON OUR ENGINE DYNO WE NEVER RUN A THERMOSTAT IN THE WATER NECK, AND THERE'S A REALLY GOOD REASON FOR THAT. THE DYNO TAKES CARE OF THE TEMPERATURE CONTROL VIA THERMOSTATICALLY CONTROLLED SWITCH ON THE BOTTOM OF THE COOLING TANK. RUNNING A THERMOSTAT IN THIS SITUATION WOULD RESTRICT WATER FLOW AND LEAD TO INACCURATE CONTROL OVER THE TEMPERATURE, AND TEMPERATURE CONTROL IS VERY IMPORTANT WHEN DYNO TESTING. (PAT)>> A RESTRICTOR LIKE THIS IS WHAT'S USED IN ALL OUT RACING APPLICATIONS. SPECIFIC SIZE RESTRICTORS ARE AVAILABLE TO TAILOR TO YOUR ENGINE'S OPERATING RANGE AND COOLING SYSTEM CAPACITY. IT IMPEDES FLOW AT A VERY SPECIFIC RATE TO GET THE PROPER TEMPERATURE FOR WHAT YOUR ENGINE WAS DESIGNED TO OPERATE IN. ANY TIME YOU SUSPECT A FAULTY THERMOSTAT YOU CAN ALWAYS TEST IT BY HEATING IT IN WATER UNTIL IT REACHES OPERATING TEMPERATURE.